A range-restricted species (EOO <200 km²) currently known from three subpopulations, one of which is potentially threatened by habitat loss and degradation due to road construction and maintenance. The population is estimated to number fewer than 1000 mature individuals, but is not currently declining. Calcrete outcrops in succulent karoo. One small subpopulation is potentially threatened by road maintenance or construction - it is extremely localized to a calcrete outcrop adjacent to an existing road. It is not known whether plants have already been lost. Two disjunct subpopulations consist of 50-100 individuals each, and a third subpopulation is much larger, consisting of about 500 mature individuals. 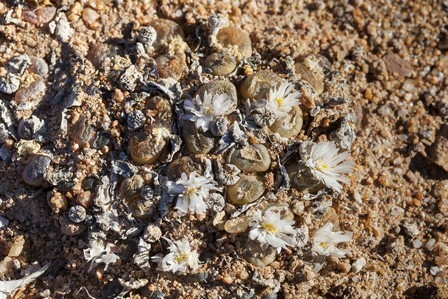 This species is localized to calcrete outcrops, and its habitat still remains relatively poorly explored. It is possibly more widespread and common than currently known. Bolus, H.M.L. 1928-1935. Notes on Mesembrianthemum and allied genera. Part II. Bolus Herbarium, University of Cape Town, Cape Town.